 Syrie/ Tripoli - ROUX, J.
Map maker : ROUX, J.. Size : 5.0 x 7.8 inches. / 12.7 x 19.7 cm. 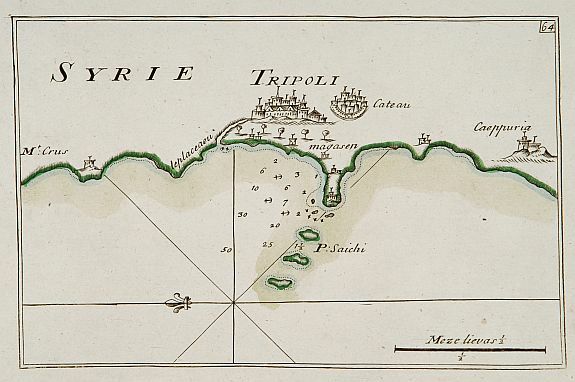 Description :Charming little charts of the harbour of the town of Tripoli, Syria in modern Lebanon. Showing town and harbour plan, with soundings, anchorages, rocks, shoals, fortifications and lighthouses. Situated north of Batroun and the cape of Lithoprosopon, Tripoli is the capital of the North Governorate and the Tripoli District. The city is located 85 km north of the capital Beirut, and is the easternmost port of Lebanon. Joseph Roux (1725-1793) was a Marseilles hydrographer who both published and as well manufactured and sold charts, navigating instruments and related nautical equipment. At about the mid-century, he received the right to be called "Hidrographe du Roy," and in 1764 published a series of 12 charts of the Mediterranean; he simultaneously published a smaller format atlas of 65 harbour charts. Condition : Sea chart on heavy paper with sharp impression.